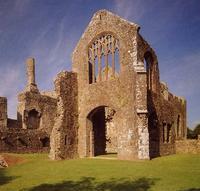 The medieval bishops of St Davids were worldly men who enjoyed the privileges of wealth, power and status. At Lamphey, near Pembroke, they built for themselves a magnificent retreat away from the worries of Church and State in which they could combine the life of a prelate with that of a country gentleman. Everything was on hand - fishponds, fruit orchards, vegetable gardens and sweeping parklands. Standards of accommodation were also suitably inviting, so it was hardly surprising that by the early 14tn century Lamphey had become a favourite residence of the bishops. The palace was established in the 13th century. As it stands, it is mainly the work of the dynamic Henry de Gower, bishop of St Davids from 1328 to 1347 (it comes as no surprise to discover that he was also largely responsible for the magnificent bishop's palace alongside St Davids Cathedral). The shell of de Gower's great hall, over 25mtrs/27yards long, is most impressive, and it is interesting to note the use of the lofty arcaded parapets, an architectural device and de Gower trademark also used to such effect at St Davids. De Gower also remodelled the courtyard, enclosing it with a battlemented wall. Later additions included a 16th century chapel with a fine, five-light east window. A4139 from Pembroke or Tenby.